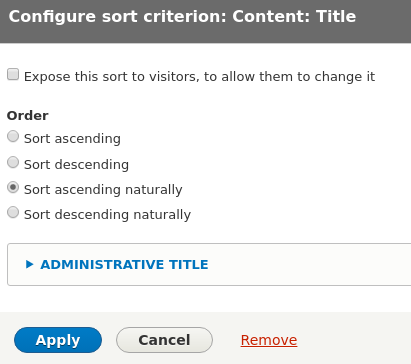 It appears the Views Natural Sort module will handle this, but it's still in Alpha for Drupal 8. Is there another, relatively straightforward (non-custom-code if possible) means of accomplishing this? I've read a number of posts addressing more complex situations with fairly complex solutions, but it seems something this simple should have a simple solution. views_natural_sort is able to do this kind of sorting. It might be currently in alpha state but it already has more than 250 installation for the alpha 3 release which means that most major bugs should have already been ironed out. Thanks to all for the suggestions. After I got Natural Sort mostly working, I ran into problems using the sorted titles with Views grouping due to accented letters (no fault of Natural Sort). For example, I'd get a group with "A" as the group heading and another group with "Á" (accented A). Add a field named sort_title to the content type and hide it from users. Add a node_presave() hook for the content type to a custom module. Replace accented letters and other international characters in the title with close English equivalents. Force the entire title to uppercase. Strip all non-alphanumeric characters from the front of the title. Add a ~ character to titles that begin with a number (because I want them to sort after titles beginning with letters). Save this sortable title in the sortable_title field for the node. Use the sortable_title field for sorting and grouping in the view, instead of the regular title field, which I was using (and which is still the one that gets displayed). I also subthemed the views-view-list.html.twig template to replace the ~ with # in the grouped heading (I had already subthemed the file for another reason anyway). This approach isn't the most general, but it's giving me exactly the outcome I want, so I'm no longer using Natural Sort. It's only about 30 lines of code in the hook function (most of that being a table of international characters and their replacements) and of course, there's the hidden duplicate of the title field.